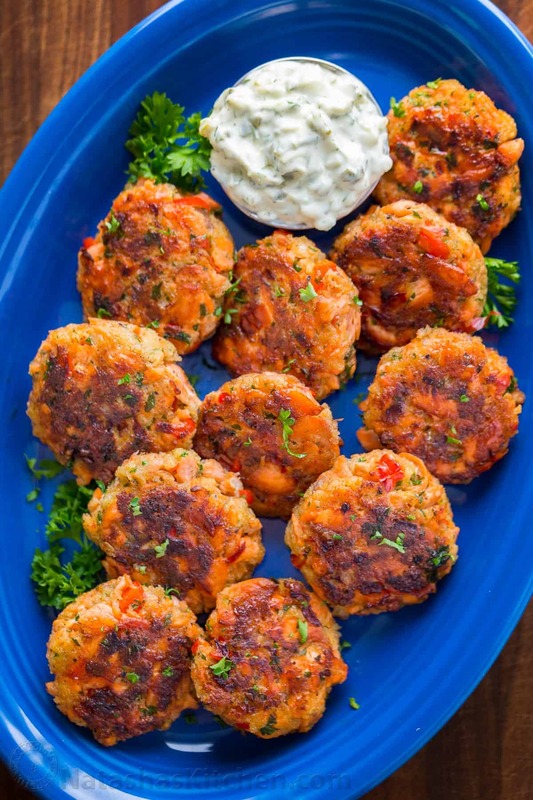 These salmon patties are flaky, tender and so flavorful. 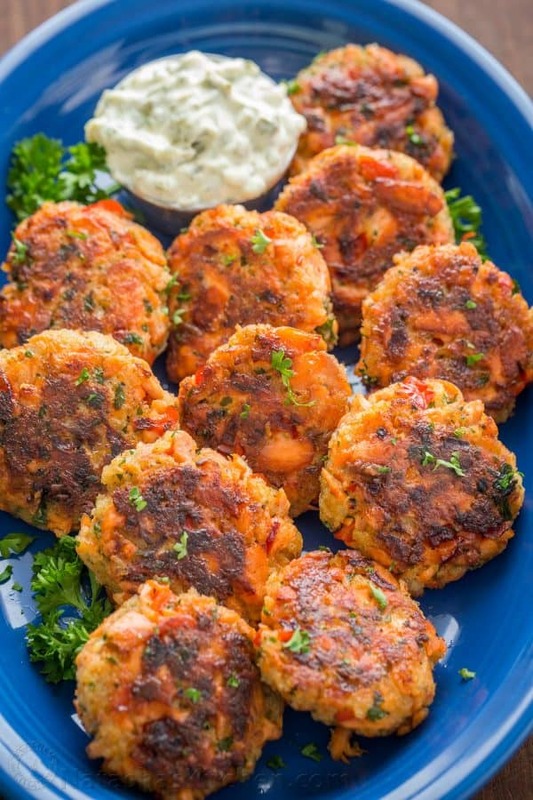 The crisp edges and big bites of flaked salmon are the hallmark of these salmon patties. They are the real deal! It’s no wonder these salmon cakes have been so popular (read the glowing reviews here). This is an easy and excellent way to use leftover salmon and it is worth it to cook the salmon just for this (instructions below). For busy weeknights, you can substitute with well-drained canned salmon or the salmon in packets which you may already have in your pantry! I hope you all love these salmon patties and the easy homemade tartar sauce that goes with them. These salmon patties are such a treat and even folks who don’t normally like salmon enjoy this recipe. They always disappear fast! P.S. 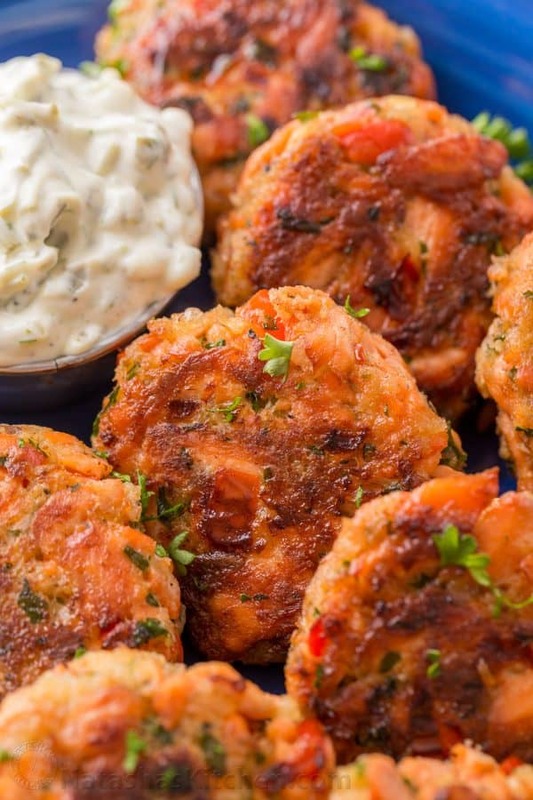 Serve salmon cakes with this irresistible homemade tartar sauce. P.S. Once you try homemade and realize how easy it is, there’s just no going back to store-bought tartar sauce. It is so much better in every way! 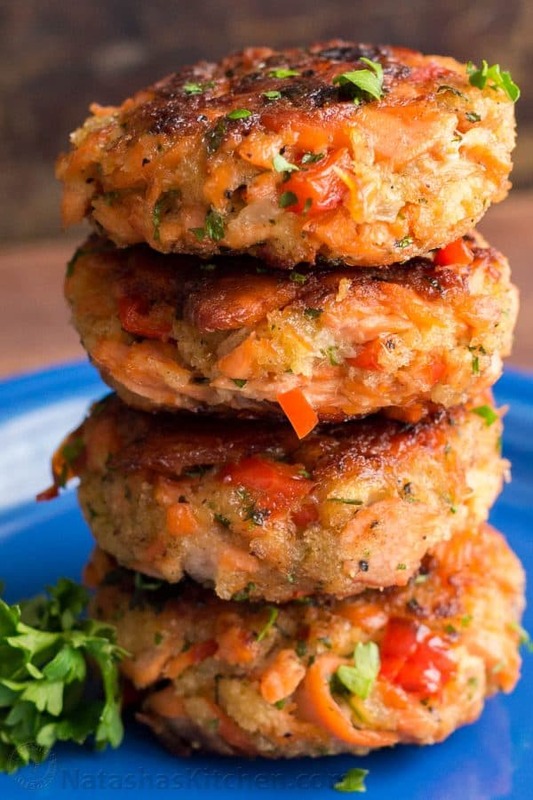 Print Salmon Patties Recipe (VIDEO) 4.9 from 22 reviews Prep time: 10 mins Cook time: 30 mins Total time: 40 mins These salmon patties are flaky, tender and so flavorful with crisp edges and big bites of flaked salmon. These salmon patties always disappear fast! 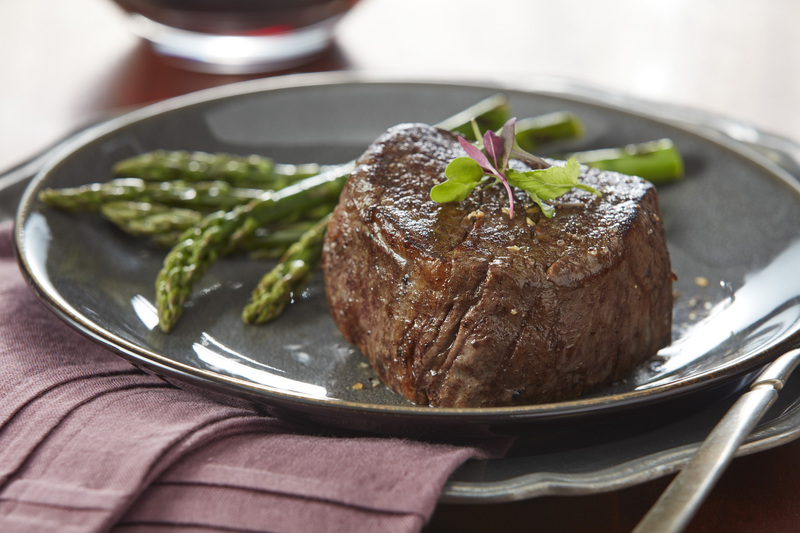 Serve with homemade tartar sauce! Author: Natasha of NatashasKitchen.com Skill Level: Easy Cost To Make: $12-$14 Serving: 13 to 14 salmon patties Ingredients 1 lb fresh salmon filet* Olive oil Garlic salt (I used Lawry’s Brand), to taste Black pepper, to taste 1 medium yellow onion (1 cup), finely diced ½ red bell pepper, seeded and diced 3 Tbsp unsalted butter, divided 1 cup Panko bread crumbs 2 large eggs, lightly beaten 3 Tbsp mayonnaise 1 tsp Worcestershire sauce ¼ cup parsley, finely minced Instructions Preheat Oven to 425˚F. Line rimmed baking sheet with parchment or silicone liner. Place salmon in the center, skin-side-down, drizzle with olive oil and season with garlic salt and black pepper. Bake uncovered for 10-15 min (depending on thickness), or just until cooked through. Remove from oven, cover with foil and rest 10 min. Flake salmon with 2 forks discarding skin and any bones then set aside and cool to room temp. Heat a medium skillet over medium heat with 1 Tbsp olive oil and 1 Tbsp butter. Add diced onion and bell pepper and saute until golden and softened (7-9 minutes) then remove from heat. In a large mixing bowl, combined flaked salmon, sautéed pepper and onion, 1 cup bread crumbs, 2 beaten eggs, 3 Tbsp mayonnaise, 1 tsp Worcestershire sauce, 1 tsp garlic salt, ¼ tsp black pepper and ¼ cup chopped parsley. Stir to combine. Form into patties (about a heaping Tablespoonful each) and mold with your hands into 2″ wide by ⅓ to ½” thick patties. ** In a clean non-stick pan, heat 1 Tbsp oil and 1 Tbsp butter until hot then add salmon patties in a single layer. Saute 3 to 4 min per side or until golden brown and cooked through. If salmon patties brown too fast, reduce heat. Remove finished patties to a paper-towel lined plate and repeat with remaining oil, butter and salmon cakes. Notes *Substituting Salmon: If desired, you can substitute the first 4 ingredients listed with 15 oz of well-drained canned salmon or salmon in packets. Leftover salmon from dinner can also be used if available. That pretty blue serving platter can be found here. I have these in different sizes and colors. I love their bold colors and how sturdy and chip resistant Fiestaware is – meant to last a lifetime. You can serve these for lunch, dinner, appetizers – they are so versatile and these salmon patties can even be used in sandwiches as salmon burgers, just form them a little larger. Q: Have you tried these yet? Let me know what you thought of them in a comment below. Have a memorable and happy 4th of July!! The 4th just happens to be my husbands birthday so if you’re on Instagram that day, feel free to flood his page with happy birthday wishes. Thanks friends! The post Salmon Patties Recipe (VIDEO) appeared first on NatashasKitchen.com.